So as you may have heard, there was a rumor that Jet Grind/Set Radio was coming to the Xbox Arcade. Unfortunately that rumor was said to be false and many cries rang out worldwide. "Oh well" I said, "I can just play it on my Dreamcast!" Well, school ended this week and I did just that. Replaying the game now, ten years after it was released, it suddenly becomes obvious to me: this is the greatest game ever. I've been going through life saying that Shining Force II is my favorite game ever but OH HOW BLIND I WAS! Hell, Jet Grind Radio wasn't even in my top three before this week. The times, they are a-changin. Now I'm here to tell you why Ashley, Jim, and Chad are wrong and why Jet Grind Radio is the greatest video game you will ever play. Ten years ago this game came out and used some thing called "Cel Shading." You may have heard of it, it's kind of a big deal. Well back then it most certainly was NOT a big deal, as Jet Grind Radio is known to be one of the first games ever to use this technology (if not THE first). This gives the game a sense of personality that games today can only hope of mimicking. Playing Jet Grind Radio isn't like going back and playing the first Half-Life where you notice how much it has aged since its release. Jet Grind Radio looked great back then and it looks great today. Color and vibrancy are what I love most about the art style. I'm red-green colorblind, so I have a lot of trouble with certain games. 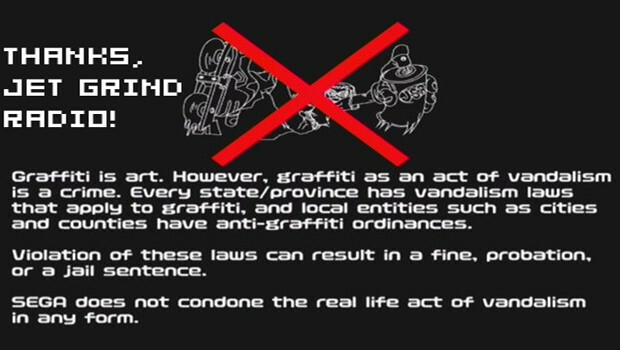 Jet Grind Radio is NOT one of those games. Every part of the game leaps out at you and makes you want to live in a world where these colors are so vibrant. Anyway, as you can tell, no two characters are even remotely alike. Each person going into this game is bound to find a character they love and stick with. It is also worth mentioning that each character has their own unique stats. There are three fields: Power (HP), Technique (size of turning circle), and Graffiti (number of cans, points, and difficulty of sprays). My favorite character, by far, is Combo. He's the huge black guy in the back holding the boombox. If that description wasn't enough, you should know that he skates, sprays, and flips while holding that gigantic box of jams. He's so fresh, Will Smith looks like a chump next to him. LOOK HOW BIG HE IS! Now, if you don't know, "Jet Grind Radio" is an actual radio station in the game, and this man is the DJ. He also serves as the narrator/commentator in the cutscenes in between missions. This man has the craziest personality I have ever seen. His voice and his appearance are something you end up looking forward to in between missions. As if the story isn't crazy enough itself, throwing this man's voice over it ramps it up to INSANE. According to his description in the instruction manual, he "is known by his super funky afro dreads." Let that seep in. Super. Funky. Afro dreads. I could have made this post with just this section and it would be just as true. Anyone who has played this game can tell you just how AWESOME the soundtrack is. Like others, it was the first dose of Jurassic 5(above) I had ever had, leading me to now love them. I always find these songs stuck in my head, whether or not I was just playing the game. I'm honestly at a loss for words to convey how fantastic these beats are. I'll just leave you with some of my favorites. And yes, you can just listen to these tunes in-game via the Radio in the Garage (your hub). The game took me two days to beat, only spanning MAYBE ten hours, probably around 8. At no point did I ever quit due to difficulty rage. By far the hardest parts of the game are recruiting new members. You can't just convince them, you have to prove your worth. This means you must match their moves or race them to a tag spot. It's admittedly rare to do the latter on your first try since chances are you aren't very acquainted with all the shortcuts and paths you can take. You may lose a few times, but you always feel that victory is within your grasp. The trick matching game is a lot easier. That isn't to say it isn't fun though. The lines that your "rival" demonstrates are usually pretty gnarly and prove useful in the game's missions. The controls themselves are very simple as well. This isn't your Tony Hawk game where each trick has its own set of buttons to input. Tricks are done by simply pressing R while you jump, provided you have enough speed to do so. Other than that you skate around pressing L to start spraying, which is where the real fun begins. The graffiti mechanics are the heart of the controls and they are superb. Essentially just quicktime events, they have you swinging the analog stick in a certain directions (half circles or full circles) to mimic the on-screen avatar. It works surprisingly well and helps bring you into this colorful and vibrant world. Evil DJ, rooftop, fire-breathing-gold-mecha-rhino, record-spinning floor (that is, the floor is a giant spinning record), and GRAFFITI. Who knew that all the world's problems (including city bombings) could be solved with graffiti? Here's the small graffiti. Mr. Destructoid's beautiful face all over Tokyo-to! And now the large one. Modeled after the Destructoid.video logo, obviously! Very slick looking, if I do say so myself! And finally, the cream of the crop. THE EPIC BROFIST! So there you have it, why Jet Grind Radio is the greatest game ever created. Hyperbole? Maybe so, but I'll be damned if it isn't my absolute favorite. The personality and uniqueness that this one game encompasses is unsurpassed in my mind. This game is the complete package. I didn't even get into things like using the INTERNET with the game to upload and share sprays, or the specifics of the ludicrous plot that makes you scream "WTF, JAPAN?!" The game also allows you to collect dozens of pre-rendered sprays, appealing to the collectivist in all of us. I also didn't get into its problems, like the wonky-at-times camera or the odd/inconvenient placement of spray cans. SEGA delivered the ultimate experience when it made Jet Grind Radio, and you really should get around to playing it. I do hope that one day it finds its way onto the current gen consoles if only to appeal to those who never got to play this gem of a game. It seems to be more of a "cult" classic because of its exclusivity on the Dreamcast, and it's quite a shame.